Creative Collective Capital Corp. (C3) will present its first Sound and Screen Finance Convention from Friday, May 3 through Sunday, May 5, 2019. The event, a first in the Southeast, will be a gathering of creative and strategic influencers and financiers who move the needle in the film, TV, music and digital entertainment (esports, video gaming, virtual reality, etc.) arenas. Register here. VIP executive ticket holders will have access to this red-carpet event featuring a speech from Georgia House Speaker David Ralston, a strong supporter of Georgia’s entertainment industry. Leaders in entertainment, banking, investing and government will discuss innovative ideas and solutions to Georgia entertainment challenges. Among topics to be covered are the policies impacting the future of Georgia’s thriving industry. Investors and industry professionals can “touch the entertainment brand” with this hands-on opportunity to experience the industry through demos, workshops, listening sessions, screenings and more. Investors will be able to meet creatives, be inspired and have the opportunity to execute deal memos on the premises of these premiere facilities. ● TAX CREDITS — Georgia’s tax credits and how your dollar-for-dollar reduction impacts investment. You will learn each step in getting the credits, how fast you receive the credit and the benefits to Georgia’s economy as a whole. ● ENTERTAINMENT ECOSYSTEM — Top entrepreneurs and corporate innovation executives will share how they entered the industry, how they are disrupting the formula, and the impact investors can make on Georgia’s whole economy. ● THE ROLE OF THE NON-BANK PLAYER — Hear from leading bankers on how investors can work with their financial advisors and private bankers to facilitate their interest in investing in the entertainment industry. ● MONETIZING DIGITAL CONTENT — Investors profiting when the content is free. ● IP LENDING IN 2019 — The ins and outs of the newly-created IP lending structure. Learn about collaborations amongst independent producers of sound and screen content with investors and distributors who are successfully navigating the world of lending to creatives. ● THE COLOR OF MONEY — Sellable content in the new millennium. This panel covers what content is commercially viable and how to take a strategized risk in creative funding for those subjects — outside of the common comfort zone of an investor’s immediate interests. 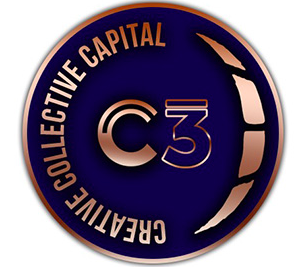 Creative Collective Capital, known as C3, is an events management company focused on the collaboration between content creators, alternative and corporate investors. We provide high-level educational networking events and conferences to investors seeking a deeper understanding of the business of entertainment.